As a siding contractor in Nicholasville, KY we offer homeowners a quality installation that lasts. We provide services for vinyl, wood and aluminum siding. We put a tremendous amount of care into each project we perform. Our installers respect your home as if it were their own. Whether it’s a repair or new install, trust in our dedicated workmanship. Our siding company provides a variety of services. We can offer anything from a simple fix to adding a new exterior to the home you’re building. It happens to all of us. Our lawnmower throws a rock, high winds blow it off or the sun causes irreversible damages. No matter what your issue is, we offer all types of siding repair in Nicholasville, KY. If you’ve been impacted from storm damages like hail or high winds, we can assist you with our insurance claim contracting services to get your property back into shape. Do you just have one piece of siding that needs replaced? A common drawback is finding the color that blends with the existing materials. We can also offer color matching for your siding that will be as close to the original product without it standing out like a sore thumb. When it comes to selecting the right application for your home’s look and functionality, we’ve got you covered! We can install aluminum, wood and vinyl siding. Our team will work with you to cover the benefits of each to help you make the right installation choice. Contact us for one of our qualified services! Would you like to know more about how we perform our work? We find that clients occasionally ask about how we are going to approach their job. The following is a case study on our most recent siding project. Siding was cracked and hanging loose from house. Submitted work order (same day) to homeowner for required repairs that included replacing all damaged siding. We removed all damaged siding and sheathing. Provided an exact match color replacement. Made improvements on the connecting components as well as the sheathing. Installed new siding. We completed this repair within one day. Our improvements secured the siding and strengthened the connections to prevent future damages caused by strong winds. While being committed to providing a quality service, we also make sure that your project is affordable. We don’t claim to be the least expensive option, but we do claim to provide our services with a solution that meets your budget, satisfaction and ensures the quality that you deserve. With the industry offering a variety of siding types, we can find the one that you can afford and gives your home the look you want to achieve. 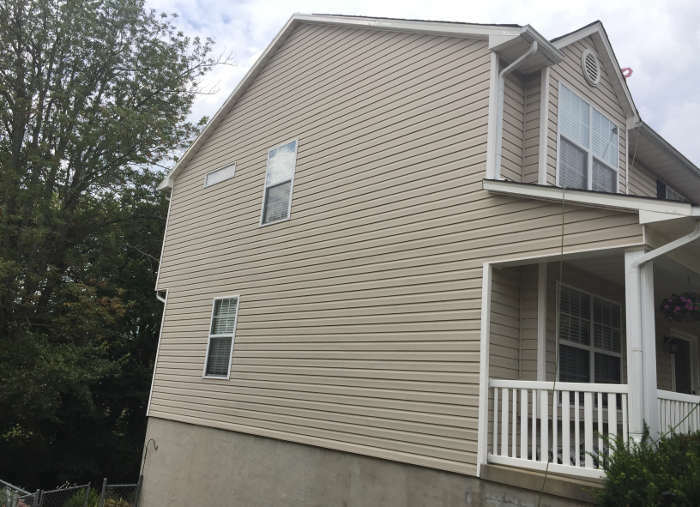 Consider our services as an affordable siding company in Nicholasville.